Below is a link to the most common used equipment for FPSO, FSO etc. For some key costumers, we have developed more specialized solutions which we are happy to present at any given opportunity – please use the contact page. Almost any invention has been made due to costumer specific needs, although all has been based on the universal challenges below. FPSO’ and FSO’ has an operational characteristic which varies a lot from traditional oil tankers, and loading un-loading rates are not always in the same range. Major causes of variation in required venting rate. Loading commences in empty tanks. Unloading to shuttle tankers at high rate compared to production rate. Major advantages of the P-V Valves and High Velocity valves manifold solution. High exit speed at all loading/production rates. High security due to numerous valves. 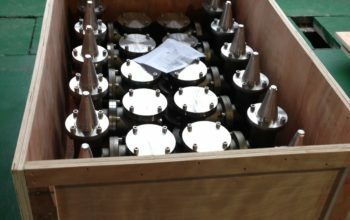 Extra valves for spares when production decreases over time.